From A Compound Eye, due out on January 24th, 2006 on Merge Records will be Robert Pollard's first solo album since dissolving Guided By Voices in 2004. When things came to an end for GBV, Pollard promised that this would not mean the end of his songwriting and recording career. It actually provided a fresh start. In leaving his band behind, Pollard was able to free himself from the expectations of "the next Guided By Voices record", allowing him to record when he wanted and what he wanted, with whomever he wanted. With From A Compound Eye's 26 songs clocking in at over 70 minutes, Pollard has finally made good on his threats of releasing a double album. And the wealth of new material is astounding. Highlights include some of the best of the Pollard / GBV canon ("Dancing Girls and Dancing Men", "I'm a Widow" and "Love Is Stronger Than Witchcraft"), as well as other nuggets that find Pollard tweaking his style and experimenting with new sounds. "A Flowering Orphan" has an elegant, if somewhat skewed, chamber pop feel, while "U.S. Mustard Company" and "I'm a Strong Lion" are buoyant and shimmering pop tunes. "Kensington Cradle" features a noisy sound collage that works perfectly, while "Conqueror of the Moon" is epic and daunting in its prog-rock grandeur. And that's just scratching the surface of the bredth and depth of the songwriting here. From A Compound Eye proves once again Robert Pollard's gift as a songwriter of remarkable talent and amazing vision. From A Compound Eye will be released on Must Destroy Music in the UK/Europe. 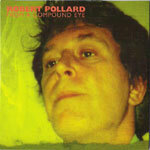 Look for Robert Pollard on tour in support of From A Compound Eye in early 2006. Pollard has already recorded a monumental solo album "From A Compound Eye", the double LP is tentatively to be released in Fall 2005. Pollard says the 26-song, 70 minute epic includes all 4 Ps - pop, punk, prog & psychedelic. The album is tentatively timed to coincide with the release of an authorized GBV book; Hunting Accidents: A Brief History Of Guided By Voices (written by James Greer, former GBV bassist/former Spin magazine senior editor). Published by Grove/Atlantic.